Its all change round here! Tom is about to start a new job. He has worked at the University of Edinburgh for the past decade, so there were an awful lot of payslips to gather up from the desk drawer, and a very hearty whisky-fuelled send-off from his friends and colleagues. It was Tom’s work as an immunologist that first brought us North to Scotland ten years ago . . . an awful lot has happened since then. His new job is in Glasgow, so today Bruce and I helped him move his office contents and cell lines over to Glasgow’s Institute of Infection, Immunity and Inflammation, where he will be establishing his own laboratory. I don’t mind admitting that I’m massively proud of Tom — he does really important work (in the field of auto-immunity) and he also works incredibly hard. This is is a very good move for him and his research. We also had a lovely walk in the park, where Bruce met a wee pug buddy . . .
And then the sun came out, and I tried to take some photographs of the crocuses that are gamely attempting to mark the transition into early Spring. Bruce is full of the joys of the season, but unfortunately has little respect for floral photography . . . or for flowers, for that matter. This picture is so hilariously characteristic that I just had to show it to you (with apologies to those who maintain Kelvingrove Park, and to those of you who feel that allowing ones dog to leap through the crocuses is a model of irresponsible canine ownership). But the image is also suggestive of the general mood of excited anticipation around here. Springing forward! Here’s to the next decade, immunological and otherwise! wow! I can’t believe you have flowers blooming in February!! In Canada, we have our fingers crossed that the snow will melt by the official start of Spring later this month and that we won’t get hit with anymore snowstorms. Love your work, love the scenery in your photos. Hope to visit Scotland one day. Bruce is gorgeous and what a good Aussie name he has!! Peri and Gilly the Golden Labradors send him wiggly waggly tails and wish you luck in your new home!! yay! congrats to Tom and best of luck on the new position. lots of happy wishes for you both! Best of luck with all the new things in your lives! And a good time for a move! Congratulations to Tom, all the very, very best to you two from France ! Having 4 autoimmune diseases, I really appreciate what people like Tom do. Thank you and congratulations on the new job! I think that last photos is absolutely wonderful! And best of luck with all the changes. Massive congratulations to Tom. That is a great position – well done! Glasgow Uni is a completely brilliant place to do science. And Glasgow is a completely brilliant city. I will follow you wherever you go! Not in a creepy way. But at a respectful distance. Wishing you and your family every success for many decades. congrats to tom, how exciting to start one’s own laboratory. shall we all have to start “walking this way”? Congrats to Tom too! I adore the flower photos – the colors are amazing. And that last photo of Bruce made my day – his energy is infectious – in a good way! Massive MASSIVE congratulations to Tom – it’s such a huge achievement to get a PI position in the current funding climate. For someone further down life science research career ladder like me, it’s always inspiring to see good people making progress :) I wish him the best of all possible starts and hope he maintains some semblance of work/life balance! Oh what a lovely pic of pooch running through spring flowers. It gives me hope, I live in Quebec and tulips are still under about 4 feet of snow! Congratulations to Tom, i can feel your pride bursting out this blog (and rightly so!). How uplifting to see those crocus bulbs in bloom and Bruce enjoying his day out too. I’m stuck in bed today but that was a great tonic. Yeh for Spring! First of all, congratulations for Tom. I can see now what a celebrity that he really is in his line of medicine. Now, Bruce … I tend to think that Labradors look best leaping over a patch of crocus, (whether or not the crocus gardener feels differently). Now you ; Kate, what can I say but that I am really happy for you and giddily waiting to see through this little window that is your blog, glimpses of your new life, new walks, new town, new home, and new inspirations for design ! HI HO to Bruce the Helium Dog! I love that you seem to catch him in mid air so often. Just charming. And- look at that high contrast colorway of yellow and black…….? Congratulations to the man of the hour, very pleased. A bright future for all is predicted. WOW! Hearty congratulations to Tom! What a staggeringly beautiful building and I do want to add, what a highly important field of research as well. So many conditions are now being lumped into that one category and a better understanding would affect a large percentage of the population. (Reminds me a trip to the doctor yesterday….) Love to see Bruce’s massively happy charge and in all fairness, mulching is an important landscaping effort. Your year is off to a fantastic start! Another hearty congratulations to Tom, and thanks for his work … my mother has severe auto-immune problems (she jokes that if you look up “incompetent immune system” in the encyclopedia there’s a picture of her name next to the entry), so I encourage him to keep on keeping on. The picture of Bruce and his buddy is lovely. 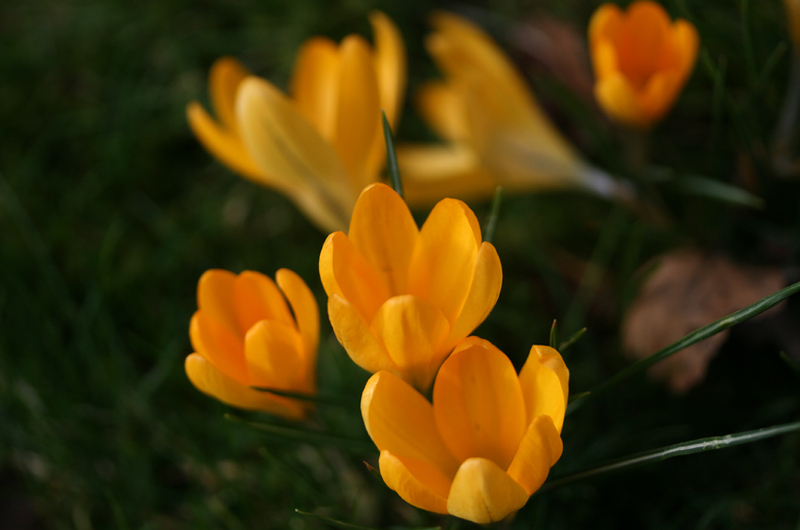 We’re still under feet of snow here, so the photos of croci make my heart sing. And speaking of Labs, what a splendid photo of Bruce. I also love his matching Pug pal. Happy Spring, everyone. Congrats to Tom! The University of Glasgow is a lovely place. And thank you for the Spring bounce that is Bruce! My daughter who lives there is adamant that there is nothing like Spring in Glasgow. It reminds me of the work of the Colourists. Boinging through the crocuses – sheer joy! Congratulations to Tom ! The picture of Bruce make me happy ! Congrats on the new post Tom. Happy people,happy dog(s), happy early spring. The signs for your spring have me a little jealous here, we were minus 13 oC today, our early spring could arrive as late as June!!! Those are some absolutely lovely pictures of the flowers. Thank you for sharing. Congrats to Tom! Would love to hear more about his work! You guys are such an inspiration, in so many ways! Cheers! Congrats to Tom! And we’re loving the first spring flowers in Seattle, too. It’s good to know someone is working on autoimmunity, as someone disabled by unknown non-inflammatory autoimmune nastiness. Congratulations to Tom on is new position!! I remember you mentioned the possibility of this some time ago. As an academic in the fiber world you will be happy anywhere and love the new adventures. Bruce looks extremely happy about the move too!! Here’s to irresponsible canine ownership! Congrats to Tom. gives me hope…. mine ate under 4 feet of snow yet! Wonderful news!! Congrats to Tom. You have a lot to be proud of Kate! As a person with an auto-immune disease I am so glad to hear Tom is working towards help for all of us! Congrats to Tom!! Love Bruce, my lab is 11 now and can’t run like that anymore. We are about to have a massive snow storm here in Chicago, yay! I personally love Glasgow over Edinburgh, but that’s just me. The Univ. of Glasgow is gorgeous! Wish I could move there. I hope everything goes well with the office move and enjoy your early spring! congrats to Tom and you both! what lovely flowers. I love Glasgow. Congratulations to Tom – and thanks for the spring flowers. Over here, the earther has been most un-Spring like. Best of luck for the move. Glasgow is where my mum and dad met……..
Congrats to Tom – it sounds like a fabulous opportunity! WOW, crocuses and we are having a mini snow storm, 2″ so far. I have a son (also a Tom) who is in research and I know how excited he gets so, GO TOM! And GO Bruce :) love that pic. Congratulations on your new job Tom! I never did know what your work was before, but I am suitably impressed, and commend you on your new position. Setting up a new lab is a big thing, so I hope your institution gives you the proper funding for everything you need, including yourself. Thanks for the picture of Bruce in the crocuses. He looks so happy, how could anyone mind? Best wishes for this new opportunity to Tom! So jealous of those crocuses that are emerging. We are expecting a “major storm” over the next 18 years or so. Hopefully we will escape unscathed as we have from previous storms this winter! Congratulations to Tom and best wishes for continued success! It’s impressive that he’s going to be setting up his own laboratory! And no apologies are needed for me regarding Bruce romping through the flowers. Just wish I could be there! Thank god for unbridled dog enthusiasm! Wish I could do that! And congratulations to both you and Tom. Really, how can you be so much farther north than us and so much closer to spring! If we’re lucky we’ll see crocuses in April. Congratulations to Tom and best wishes with the move, which will be stressful (moves always are), but in a good way I hope. A move is so refreshing and exciting… And a lot of work of course. I had to google map to get a visual on it, and that will be quite a change. No Crocus in sight here in Ontario, just hard dirty snow and ice, but as soon as March comes we will breathe a sigh knowing that spring is just around the corner. I am a Glaswegian living in France. 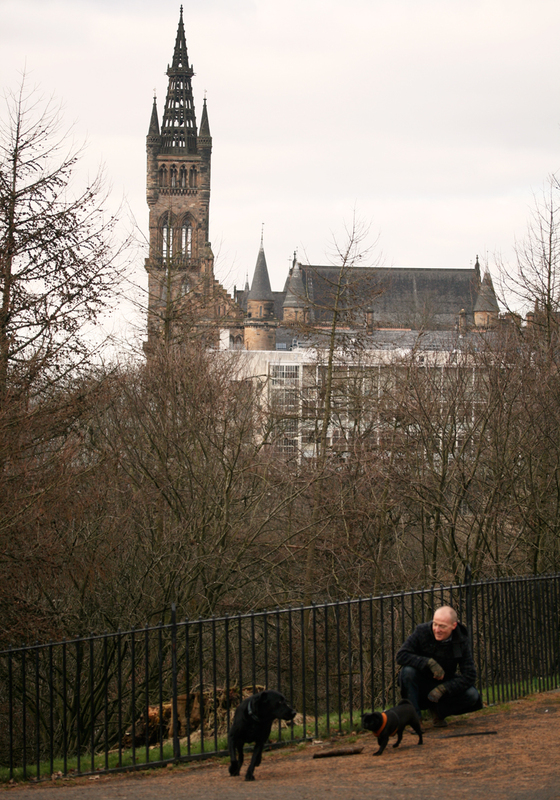 I studied at Glasgow Uni and Kelvingrove is one of my favourite places in the city. Sounds like Bruce will be adding it to his list of faves too ! Wishing you all happy times in the Dear Green Place. What great news! Good for Tom. I’m delighted for you both. (which is ridiculous considering I don’t really know you). Congratulations to Tom from Madison, Wisconsin, USA. My grandmother was raised in Airdrie – – right between the two cities! Love to Bruce – – I love black labs and appreciate his exuberance! 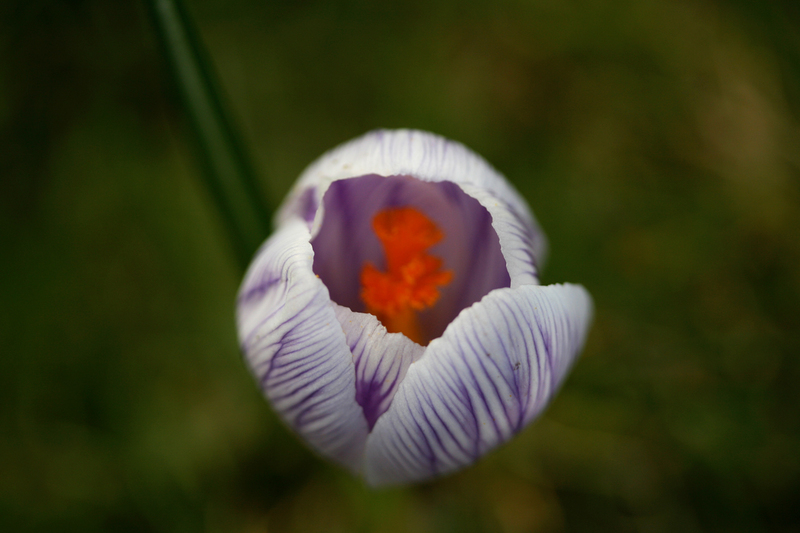 I would love to see inspiration from the crocus as art in knitting. Crocus is my favorite flower. Is so cheerful, enduring, and beautiful, surely there must be something to design with crocus in mind. Congratulations to Tom on his new endeavors in immunology. Sounds like a great opportunity. And Bruce can gallop through any flowers as far as I’m concerned, he’s such a joy. Congratulations to Tom on his new job. 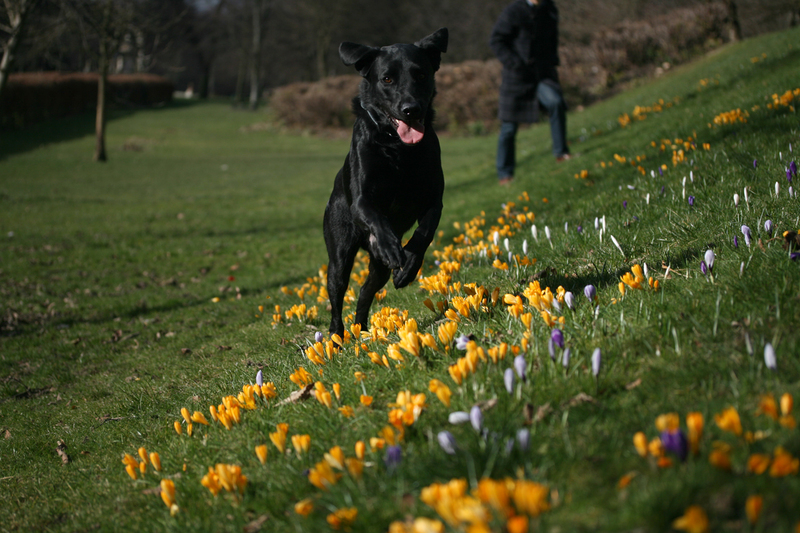 Your photo of Bruce galloping ecstatically through the crocuses is absolutely wonderful and I say there’s absolutely nothing wrong with allowing your dog to run through the flowers. I’m with Andy on this, you really should frame that picture it is fantastic. Hope you are enjoying your new research. Can’t wait to hear more about it. Congratulations to Tom and all as well as many thanks for his important work. The crocuses have survived thus far and are undoubtedly safe after Bruce’s romp. Perhaps you will be inspired to create some knitting masterpieces based on the incredible works of Charles Rennie Mackintosh whilst enjoying Afternoon Tea at The Willows Tea Room… :) Best wishes for this exciting new chapter in your lives! Congrats to Tom. Gotta love Bruce. Bruce is just wonderful – thanks for sharing him. Congrats to Tom, too. Huzzah to Tom on his new venture! I suffer from an auto-immune disorder and I applaud your husband for the work he is doing in this field. Never apologize for Bruce enjoying life, even if it means romping through a field of crocus! We should all take Bruces example and dance in the open, wild and free! Love that Tom will work the I.I.I.I. It’s just fun to say! And, best of luck to both of you on all your transitions. I can’t decided what photo I like better: Bruce and Pug with their respective appropriately-sized sticks, or Bruce bounding through the crocus! Congratulations and best luck with the move. Thanks for spring fever photo of Bruce with crocuses. Ooh… A long time ago I had to say goodbye to George Street permanently and it left me sad and blue. But Glasgow has so much to offer… Maybe you can incorporate Charles Rennie Mackintosh into your colourwork? :) I hadn’t seen your post until after I posted below. I, too, would love to see Kate’s interpretations of the works of the Scottish treasure that is Mr. Macintosh. Congratulations to Tom — that is wonderful news. And thanks for the joy that springs from your post, “caninified” by Bruce’s crocus dance. “Caninified.” If it isn’t in the dictionary, it should be!! Congratulations to you both! A change is a good as a rest, they say. Your photograph of Bruce and the crocuses gives me hope for the season to come- it’s been unbearable wintry in Ontario this year, and we’ve been spoiled by the last few mild ones. How inspiring. How wonderful for Tom! Please add my congratulations and well-wishes in with the rest! yay for bruce’s other human! and as always, bruce is the most handsome, most photogenic dog in the whole world. I was wondering what had happened about Tom’s move, so pleased to hear that all is, as you say, springing forward. Congratulations to Tom, how wonderful and what important work he does.. Are you going to be moving? Congrats to Tom! I’m very envious of your lovely crocuses. We’ve got quite a layer of snow down but it won’t be too long and ours will be popping up too. Moves are refreshing. As someone with a couple of autoimmune disorders, I am happy to see anything that enhances research! Me too! I only have one so far but that’s enough to appreciate work being done. Congratulations! Thats wonderful! Does it mean you have to move? Congratulations to Tom! Bruce’s romp through the flowers is priceless! Thank you for the happy photo. Kate, So wonderful to hear of your positive attitude towards change and transition! I and my hubby are in midst of a change that causes us angst and grief, but we know when we embark on a new journey we will discover much good in it. Right now we try to let go, and be open to the possibilities. So happy for you that you have new work endeavors to be excited about! A big hug from Holland: All the best for Tom! Luckely you have Bruce to stay with you! That photo is worthy of a Bruce post! Congratulations to Tom on establishing his own lab! How perfectly wonderful! Congrats to Tom. Much love for Glasgow over here too. There might be a wee bit of glasgow-chic slipping in then, we hope? What wonderful news for you and Tom!!! Kelvingrove Park is beautiful! I’ve even been there. How fun! Crocuses can handle a little dog-joy, I think. It’s not like Bruce was digging or anything. We have snow. The dogs are enjoying it. Edinburgh to Glasgow is a significant transition. My copy of Colours of Shetland arrived while I was traveling last week, and this morning my treat for meeting two deadlines was to open it up and begin the delight of discovering it. Thanks for the way you integrate the place, the knitting ideas, the history. . . . Perfect. I cannot believe that had the patience to wait as long as you have. And what will you spin first for what project? Congratulations to Tom! People rarely believe me when I say that Glasgow is one of the friendliest cities I’ve ever visited, but it is. ← Digital Colours of Shetland!